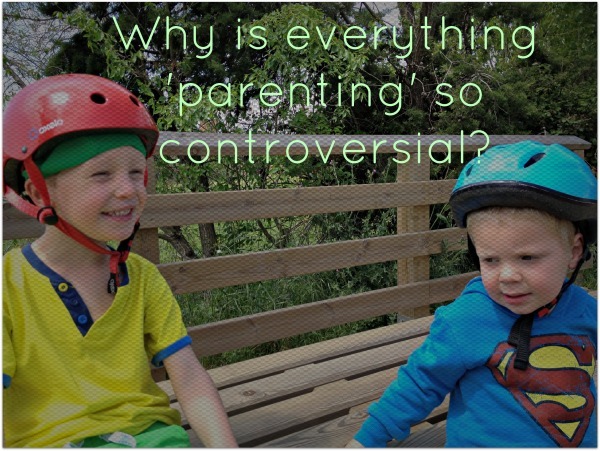 Why is everything 'parenting' so controversial? Ever since I was young I've loved traveling. I've loved seeing how other people live and do things. Sometimes, quite similar to us, sometimes quite different. But it's the different-ness that I love. I love the strange smells, the strange sites, the strange people and the strange things they do. But that's what makes the world an exciting place isn't it? Widening our horizons and seeing new things. You'd think it would be the same with parenting wouldn't you? Some people do things the same, and others do things differently. But don't we all, or at least the majority of us, do what we think is best for us and our family. And obviously what's good for one person isn't necessarily what's good for another. Before becoming a parent, I was aware that vaccinations were controversial. But that was a whole heap of years ago. People were still figuring out the whole MMR thing. It wasn't until after I became a parent, in fact, started writing, that I realised that most things 'parent' are controversial in one way or another. As I say, I find what other people do really interesting. Even if I don't want to do it that way, I'm still interested to find out why other people think it's a good idea. Sometimes I can understand why they do it, sometimes I can't. But that doesn't matter. I have to confess there are times when I read things that make my heart sink. Whether it's someone else berating another person for their views and the way they do things, or more rarely actually what they're doing and the choices they've made for their children. I'd like to chat it over with them, but I know that neither of us will change our minds and it's easier to avoid the conversation altogether. It's sad that we can't communicate about things that matter. But that's not the case on the internet. I perfectly happy for people to discuss things, in the name of coming to the 'truth' of something. But more often than not, people fall back to shouting their opinion at each other. I don't really understand why. Is it that we feel threatened by people doing things differently? Is it that we feel that people are saying we're doing a bad job by our children? Is it that we feel insecure in our own decisions and don't like people threatening the security that we've created? Is it that some people want to be heard but don't really want to listen to anyone else? I don't know the answer. I'm genuinely posing a question. It does feel to me that there isn't any aspect of parenting that is controversy free. Sleeping, crying, feeding as babies. Discipline, feeding again, TV, toys as older children. Not to mention vaccinations. You name it, you can shout about it somewhere on the internet if you want to. Although strangely I think that if you have a thought out position, you're less likely to start shouting at people (that's not 'FACT' that's just my idea).